A Montreal based fashion designer and professor at University of Quebec in Montreal, former head of Fashion, jewellery and accessories design Programme at HEAD-Genève, Ying Gao has achieved personal distinction through her numerous creative projects: six solo exhibitions in France, in Switzerland, in Canada, and more than one hundred group exhibitions around the world. Her varied creative work has enjoyed international media coverage: Time, Vogue, The New York Times, Dazed and Confused, Interni, ARTE. She is one of the “Fab 40: Canada” selected by Wallpaper magazine. 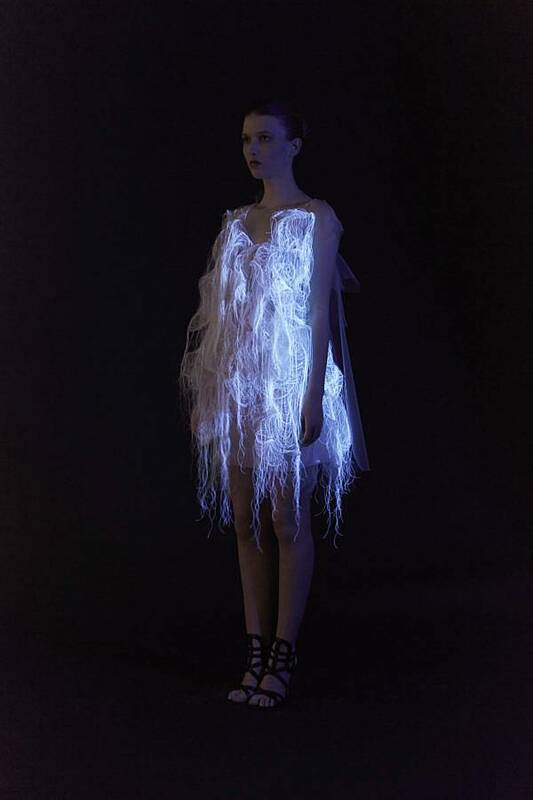 Ying Gao questions our assumptions about clothing by combining fashion design, product design and media design. She explores the construction of the garment, taking her inspiration from the transformations of the social and urban environment. 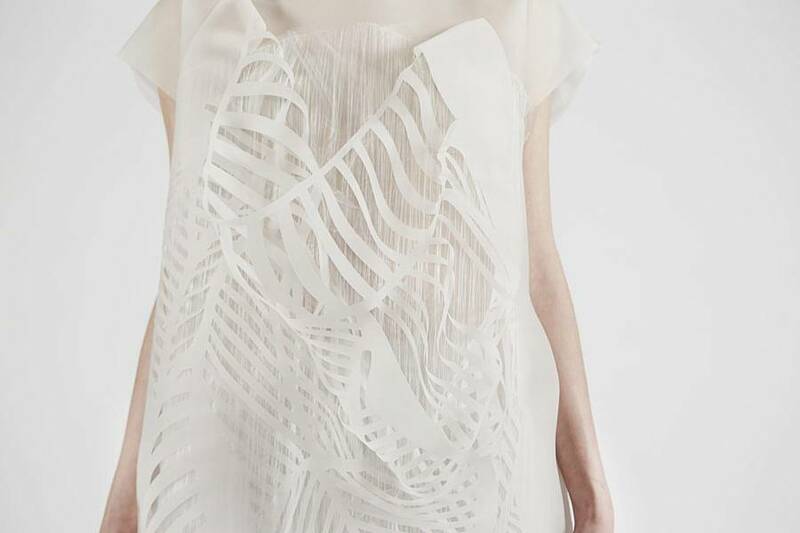 Design is the medium, situated in the technological and the textile realm : sensory technologies allow garments to become more poetic and interactive. 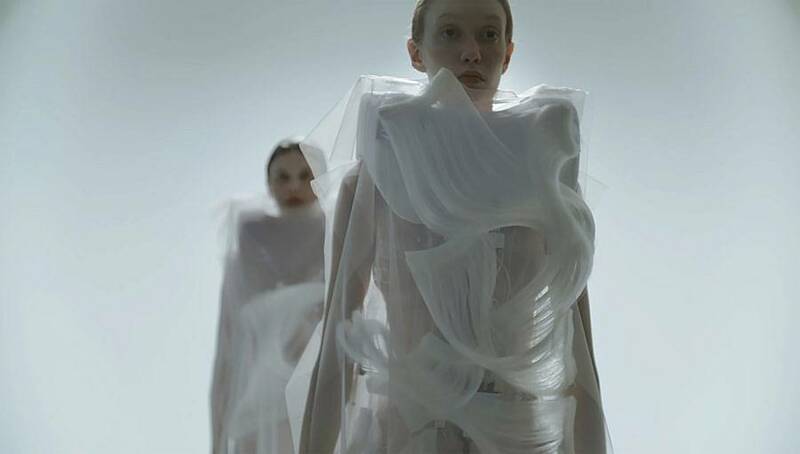 Ying Gao explores both the status of the individual, whose physical contours are transformed by external interferences, and the garment’s function as a fragile transitional space. Her work testifies to the profound mutation of the world in which we live and carries with it a radical critical dimension that transcends technological experimentation. Portrait by Max Abadian. I am a fashion designer and professor at Université du Québec à Montréal, Canada. I call my design work “speculative design” or “design fiction,” It’s radical, experimental and slow. 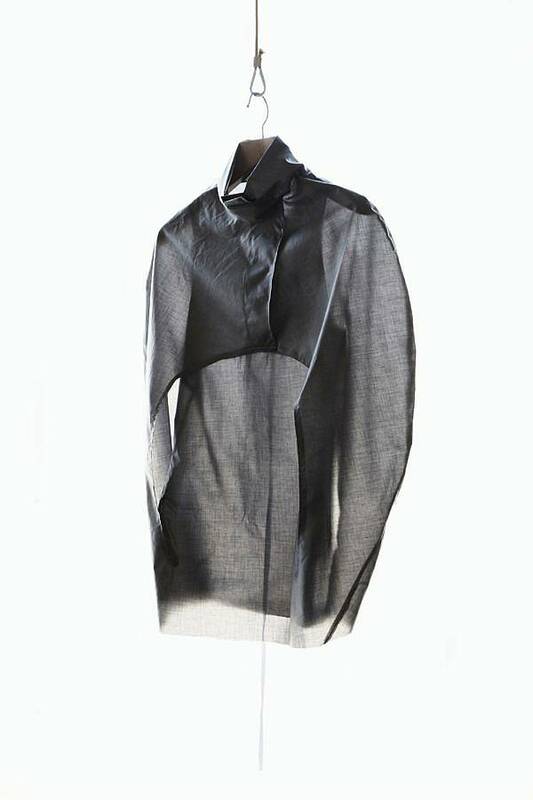 My garments are developed through elements such as computational systems, motors, sensors, pneumatic and interactive technologies and embedded electronics. Many of them respond to their immediate environment and to the presence of the spectator. When I was a child, my mother took me to the first exhibition of Yves Saint Laurent at the Palais des Beaux Arts in Beijing. This was in the 80’s and China was still a country where all dress conformed to social and political norms: blue and gray uniforms, which I found rather beautiful, especially since I always loved sobriety. The work of Yves Saint Laurent, to be truthful, did not strike me by the elegance of its style, by the richness of its fabrics, the precision of its silhouettes, and even less by the intense colors, which, in fact, hurt my eyes. His work communicated to me a much more essential quality, which influenced me during many years: the concept of the foreign, the dissimilar, and the different. The only thing I really saw, that day, at the Palais des Beaux Arts in Beijing, was a certain difference. A difference in culture and in world vision. I felt very banal that day, and I told myself that I would like to accomplish something different, when I grew up. Then I spent my teen years in Switzerland. I studied fashion design at HEAD-Geneva and then at UQAM in Montreal where I teach now. Professionally, Switzerland taught me to be thorough and focus on details, whereas Montréal gave me the freedom to think and experiment. What role do you see design playing today and in the future? Your work bridges disciplinary gaps between art, design, technology, fashion, architecture, etc… do you still see a need for these distinctions or is it becoming increasingly important to abandon them? Yes, the distinction between disciplines remains important. I believe that fashion is precisely the system that encompasses the object – clothing. Clothing is the substance of this system. 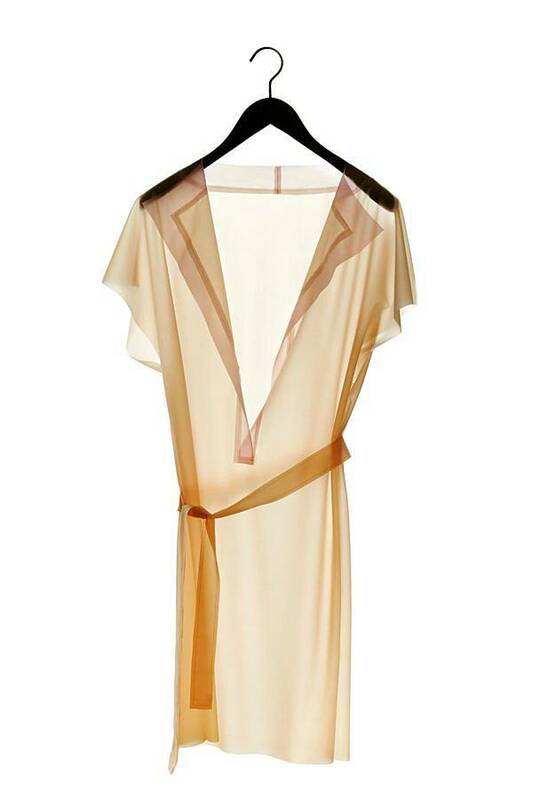 Fashion remains the dominant phenomenon of which clothing is a component. I am convinced that there are clothes that are not part of the fashion system, but which tend to be closer to disciplines such as architecture, industrial design, media design etc. 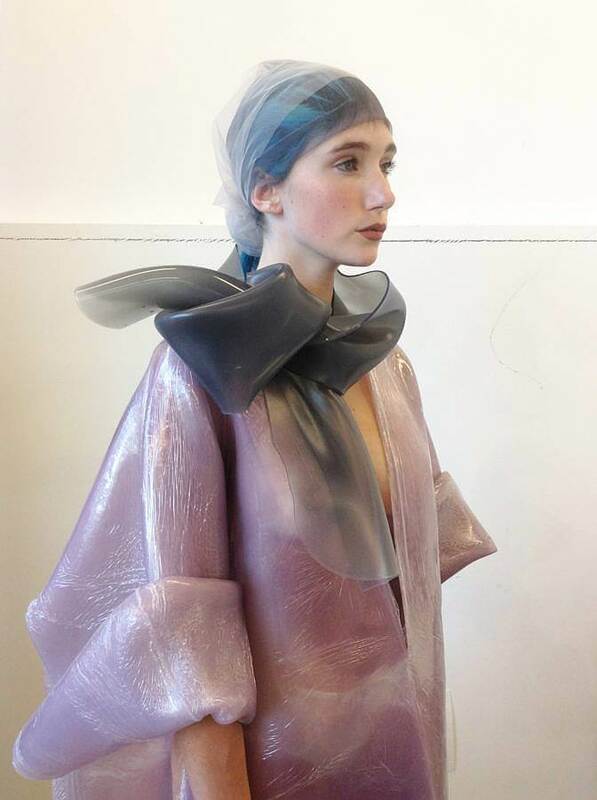 Throughout my interactive garment projects, which unite my two areas of interest (fashion design and media design), I wanted to pursue the structure of clothing, but most of all, I wanted to explore the possibility of working with intangible elements that are found in our physical world. Elements such as air and light are full of ambiguities. I love creating shapes from intangibles. My upcoming project is called Flowing water, standing time. 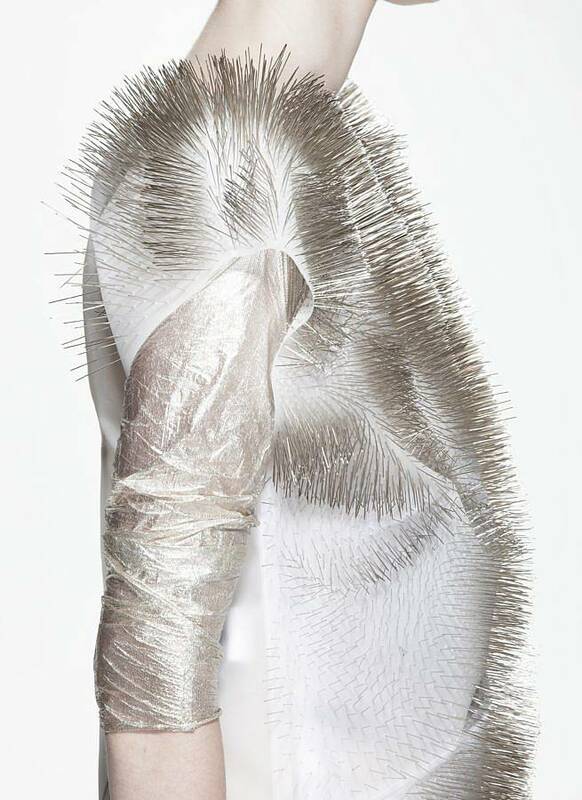 This creation emphasizes the autonomy of clothing to act and react by physically transforming itself. It is intended as a place to reflect on current questions in speculative design and an attempt to answer them. I found my inspiration in a book written by the neurologist Oliver Sacks: “The Man Who Mistook His Wife for a Hat.” Sacks describes the case of Jimmie G., a patient, who at the age of 49, is convinced of being 19 and just about to leave the Navy. Shocked by his own image when Sacks hands a mirror to him, Jimmie nevertheless becomes the 19-year-old again as soon as he moves away from his reflection. What’s your design process like? Is it research heavy? I read a lot when I start a project. I am often inspired by literature, cinema d’auteur and documentary films. But I don’t write much, because it’s not my field. Cinema d’auteur, philosophical essays, fictions, medical cases…all this inspires me. The research work is the most important part of the process, I spend a lot of time finding the right materials to express « intangible » which is central to my creative concept and to my fabricated work. Elements that cannot be touched or grasped are vital structuring components of my garments. In some instances, this immateriality is conveyed through a fabric so diaphanous as to be barely there, as if the primary material were air given visible form. Other insubstantial elements are also integral to my practice: a work can be activated by the sound of a voice, the stimulus of a gaze, a flash of light, bringing both concept and garment into definition.The intangible is also highlighted along another axis, that of mutation. Change, flow and un-fixity are characteristic of many of my clothes. The garments change, coming alive in unpredictable ways. These material transformations extend as well to my use of fabrics, in novel applications. The intangible as both (im)materiality and mutability gives value to the absences through which presence is structured, to flux over fixity, and to the flows between these polarities. In this way, the valuation of the intangible could be said to constitute a philosophical stance, one alternative to the predominance given in Western traditions to presence and visuality. What’s your least favorite trend in the design or fashion world? The adoration of the image, and only the image. The Society of the Spectacle. Social networks propagate the idea that only the image counts. But it is quite the opposite. There must be the object first, and then the image, eventually. Who are some of your favorite artists or designers? When people tell me that they like what I do, because they think that the garment of the future will communicate our emotions, that it will light up when we are happy or sad, I systematically answer: but I hope it will never happen. Because it’s such a depressing concept… depressing because it’s so unadulterated. As uncluttered as a Christmas tree or an advertising billboard. I would like people to understand that I don’t do science fiction. These are not clothes from the future. These objects represent for me the here and now. The ideas I express through these objects reflect the questions and uncertainties we are already experiencing today. What’s your favorite place in the world to spend time? creative projects, inspired by the complexity of the relationship between the individual and their environment.